FISHING CREEK CAMPGROUND WILL BE CLOSED TO BEGIN THE 2019 RECREATION SEASON. Historically high pool elevations at Lake Cumberland have impacted the facilities at Fishing Creek Campground. As a result, the campground cannot open until the damages are fully assessed and remediated. 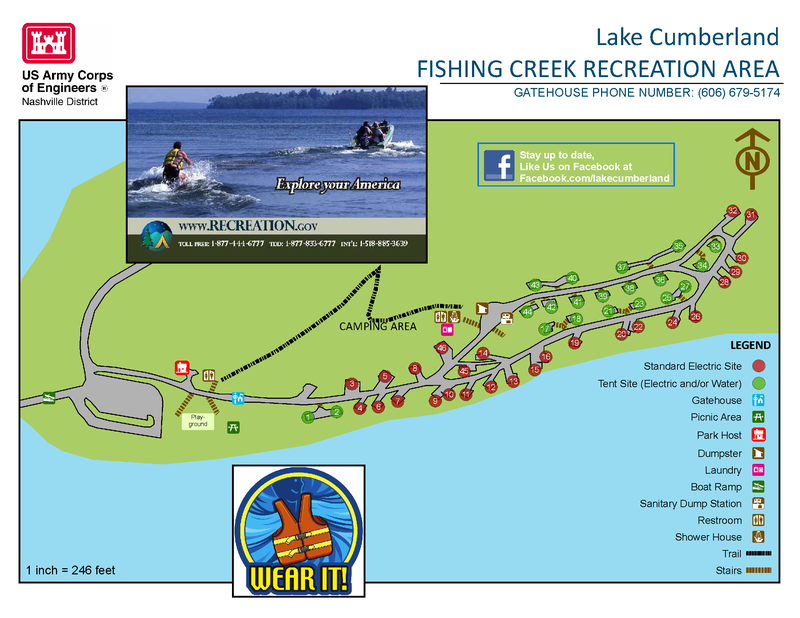 The Lake Cumberland Natural Resource Management staff is working to facilitate repairs of Fishing Creek Recreation Area and will notify the public immediately with any updates to this closure. Contact the Recreation.gov reservation line toll-free 1-877-444-6777 between 10 a.m. to midnight Eastern Standard Time between March 1 and Oct. 31 and 10 a.m. and 10 p.m. EST between Nov. 1 and end of February for information and to make a reservation. Call centers are closed on Thanksgiving, Christmas, and New Years Day. Group sales for ticketing is closed on Sundays. You can also get information and make reservations online here at Recreation.gov. Fishing Creek Recreation Area has forty-six (46) campsites with water and electric hook-ups. The campsites will accommodate tents up to the largest RV’s. A playground is located in the day use area next to the campground. Fishing Creek recreation area is located just outside of Somerset, KY on Highway 1248 upstream of Lee’s Ford Marina Resort. For a map of Fishing Creek Recreation Area and campground regulations please click the image below.